Matthew Corbin is obsessed with cleanliness; desperately trying to avoid germs and disease, his behaviour has become so extreme that he is missing big chunks of school. His hands are sore and painful from all the washing, his antibacterial spray and latex gloves safely concealed under his bed. Martin avoids all human contact, eats only pre-packaged foods and rarely leaves the house. Instead, he spends his days observing his neighbours from the safety of his bedroom window, noting down what they're up to on his quiet cul-de-sac street. Unusually, Mr Charles next door is looking after two young children that Martin has never seen before- a toddler and an older girl. They see him watching them, bestowing him with the nickname Goldfish boy. When the boy goes missing, Matthew is suddenly at the centre of a mystery; one where all his neighbours are suspects. Matthew thinks he might have information that can help, but going outside into the world is quite scary and he's not sure that he's ready for that yet. Goldfish Boy is a slow-burner of a story, if the reader is expecting a mystery. The missing toddler, Teddy, provides the momentum of the plot, but it is really about Matthew's personal journey. It's about how he deals with losses in his life, loneliness and the early beginnings of friendship. It's quite frustrating at first, because Matthew's parents don't really seem to see how ill he is. Either because he is good at hiding it, or because they don't want to believe that their only son has debilitating mental health issues. As the story unfolds, we start to see that the Corbins as a family are coping in whatever ways they can. The compulsive cleaning and 'Magical Thinking', while being the OCD bread and butter, are sensitively handled and compassionately explored throughout the book, which feels compassionate and well researched. I felt like Matthew's frustration and fear were incredibly real, and his reactions to these emotions equally believable. I liked that he *knew* his fears were irrational, but his brain was not allowing him to listen to its own reason. The book is also about suspicion and judgement, and the fact that nobody can ever really know what a person is like, nor how they fell and what they've been through merely by looking at them. I loved Matthew's interaction with Old Nina- how much he learned from her. Matthew's recovery is only really beginning by the time the book ends, but the reader is left with the sense that with his therapy, his newfound friendship with the super-persistent Melody and the 'I'm only mean to you because I'm insecure' Jake and finally being able to be honest about his feelings, it feels like Matthew will be ok. Very much recommended not so much as a Middle Grade Mystery, but as a novel that really places the reader in the position of a child really struggling with his mental health. 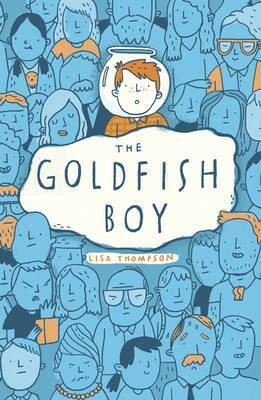 Themes of guilt and compulsion and feeling like you're letting people down are explored in really relatable ways, and Matthew is a likable little chap that manages to find his strength.